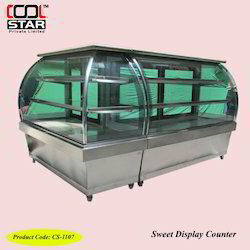 OEM Manufacturer of a wide range of products which include l shape sweet display counter, l-shape sweet display counter, l-shape display counter, l-shape display counter non ac and sweet display counter koriyan. Our company is among the prominent manufacturers and suppliers of optimum quality L ShapeSweet Display Counter. Available with us at highly affordable market prices, these display counters are used by various bakery shops, hotels and restaurants. 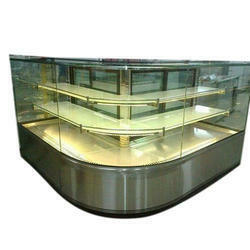 The offered counters are available with us in customer stated specifications. 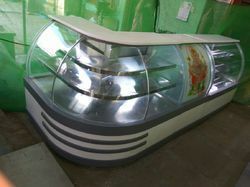 Our company is among the prominent manufacturers and suppliers of optimum quality L-ShapeSweet Display Counter. Available with us at highly affordable market prices, these display counters are used by various bakery shops, hotels and restaurants. 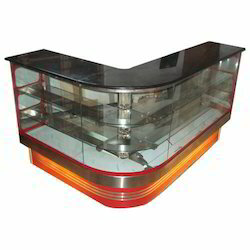 The offered counters are available with us in customer stated specifications. Granite or Marble top with same matching front panel. 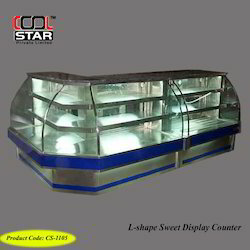 cool star the topmost manufacturers and suppliers of supreme quality L-Shape Display Counter in the industry. Available with us at cost-effective prices, these counters are used to store and display various sweets in an organized manner. Our logistics professionals assure timely delivery these counters at the customers’ end. 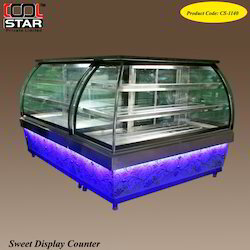 Cool Star sweet display counter koriyan body pasting 10 mm, top kiriyan compressor emotional Copland glass 10 mm very nice. Looking for L-Shape Sweet Display Counter ?